Whether you’re planning a holiday dinner for ten or two, a set of porcelain china can add an air of elegance to your meal. But getting out the china doesn’t necessarily mean dusting off your grandmother’s collection. There are a plethora of designers who are crafting elegant, contemporary, china dinnerware, which will show off your personal style, without startling your in-laws. No matter how dinner turns out, it’ll look great on these modern china sets. The solid black bands and platinum edges turn this bone china set into a graphic statement. Each plate uses a different variation of the same motif, to distinguish between dishes, while creating a seamless flow through your holiday dinner. A robin’s egg blue band adds a delicate and playful touch of color. Mixing and matching china sets can be difficult, but when done well, it can be a bold statement. If you’re looking to add a bit of color to an all-white set of china, look no further than the Kintsugi Sarkis Plates from Bernardaud. The gold detailing is individualized to each plate in the collection, and adds a personalized touch that is also excitingly elegant. Wedding china doesn’t have to look outdated. Inspired by the trim used in Vera Wang wedding dresses, this collaboration between Wedgwood and Vera Wang is the perfect set for any newlywed couple. Wedgwood is one of the oldest English manufacturers of fine china, but this modern set never feels outdated. Waterford is a world-renowned brand known for their distinguished glass crystal pieces. But their china collections are also of the highest order. This set uses a gold, micro-print celtic pattern, for a contemporary twist on the company’s Irish heritage. This all-white china set is anything but standard. The Rosenthal Tac 02 collection was designed by one of the 20th century’s greatest architects, Walter Gropius, and incorporates the Bauhaus emphasis on functionality, while looking exquisitely modern. With a distinct, yet elegant border patter, the Monique Lhuillier Opulence collection from Waterford certainly lives up to its name. If you’re looking for a traditional design that doesn’t feel musty, consider the Royal Copenhagen Blue Elements collection. With over 200 years of craftsmanship behind each plate, this collection is sure to outlast any and all changing trends. A vivid, modern design is balanced by an elegant gold pattern for an entirely original set. 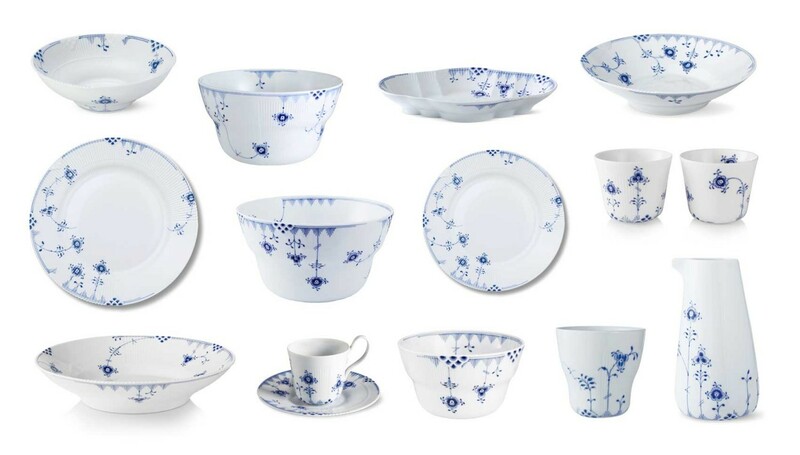 This collection is certainly not your grandmother’s china. If you’re looking to show off your art history know-how, consider this collection of art-deco inspired china from Philippe Deshoulieres. The contrast between the powder blue and matte gold is both timeless and modern.